This article is about the building material. For the software company, see Adobe Inc.
Not to be confused with abode or adobo. Adobe wall (detail) in Bahillo, Palencia, Spain. Shiraz, Iran. Its urban gardens are separated by adobe walls. Adobe (/əˈdoʊbi/ ( listen); Spanish pronunciation: [aˈðoβe]) (Arabic: الطوب‎, translit. aṭ-ṭūb) is a building material made from earth and organic materials. Adobe is Spanish for mudbrick, but in some English-speaking regions of Spanish heritage, the term is used to refer to any kind of earth construction. Most adobe buildings are similar in appearance to cob and rammed earth buildings. Adobe is among the earliest building materials, and is used throughout the world. 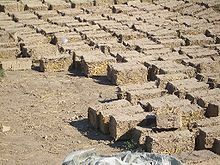 Adobe bricks are rectangular prisms small enough that they can quickly air dry individually without cracking. They can be subsequently assembled, with the application of adobe mud to bond the individual bricks into a structure. There is no standard size, with substantial variations over the years and in different regions. In some areas a popular size measured 8 by 4 by 12 inches (20 cm × 10 cm × 30 cm) weighing about 25 pounds (11 kg); in other contexts the size is 10 by 4 by 14 inches (25 cm × 10 cm × 36 cm) weighing about 35 pounds (16 kg). The maximum sizes can reach up to 100 pounds (45 kg); above this weight it becomes difficult to move the pieces, and it is preferred to ram the mud in situ, resulting in a different typology known as rammed earth. In dry climates, adobe structures are extremely durable, and account for some of the oldest existing buildings in the world. Adobe buildings offer significant advantages due to their greater thermal mass, but they are known to be particularly susceptible to earthquake damage if they are not somehow reinforced. Cases where adobe structures were widely damaged during earthquakes include the 1976 Guatemala earthquake, the 2003 Bam earthquake, and the 2010 Chile earthquake. Buildings made of sun-dried earth are common throughout the world (Middle East, Western Asia, North Africa, West Africa, South America, southwestern North America, Spain, and Eastern Europe.) Adobe had been in use by indigenous peoples of the Americas in the Southwestern United States, Mesoamerica, and the Andes for several thousand years. Puebloan peoples built their adobe structures with handsful or basketsful of adobe, until the Spanish introduced them to making bricks. Adobe bricks were used in Spain from the Late Bronze and Iron Ages (eighth century BCE onwards). Its wide use can be attributed to its simplicity of design and manufacture, and economics. A distinction is sometimes made between the smaller adobes, which are about the size of ordinary baked bricks, and the larger adobines, some of which may be one to two yards (1–2 m) long. The word adobe /əˈdoʊbiː/ has existed for around 4000 years with relatively little change in either pronunciation or meaning. The word can be traced from the Middle Egyptian (c. 2000 BC) word ɟbt "mud brick". Middle Egyptian evolved into Late Egyptian, Demotic or "pre-Coptic", and finally to Coptic (c. 600 BC), where it appeared as τωωβε tōʾpə. This was adopted into Arabic as الطوب aṭ-ṭawbu or aṭ-ṭūbu, with the definite article al- attached. tuba, This was assimilated into the Old Spanish language as adobe [aˈdobe], probably via Mozarabic. English borrowed the word from Spanish in the early 18th century, still referring to mudbrick construction. In more modern English usage, the term "adobe" has come to include a style of architecture popular in the desert climates of North America, especially in New Mexico, regardless of the construction method. An adobe brick is a composite material made of earth mixed with water and an organic material such as straw or dung. The soil composition typically contains sand, silt and clay. Straw is useful in binding the brick together and allowing the brick to dry evenly, thereby preventing cracking due to uneven shrinkage rates through the brick. Dung offers the same advantage. The most desirable soil texture for producing the mud of adobe is 15% clay, 10–30% silt, and 55–75% fine sand. Another source quotes 15–25% clay and the remainder sand and coarser particles up to cobbles 50 to 250 mm (2 to 10 in), with no deleterious effect. Modern adobe is stabilized with either emulsified asphalt or Portland cement up to 10% by weight. No more than half the clay content should be expansive clays, with the remainder non-expansive illite or kaolinite. Too much expansive clay results in uneven drying through the brick, resulting in cracking, while too much kaolinite will make a weak brick. Typically the soils of the Southwest United States, where such construction has been widely used, are an adequate composition. Adobe walls are load bearing, i.e. they carry their own weight into the foundation rather than by another structure, hence the adobe must have sufficient compressive strength. In the United States, most building codes call for a minimum compressive strength of 300 lbf/in2 (2.07 newton/mm2) for the adobe block. Adobe construction should be designed so as to avoid lateral structural loads that would cause bending loads. The building codes require the building sustain a 1 g lateral acceleration earthquake load. Such an acceleration will cause lateral loads on the walls, resulting in shear and bending and inducing tensile stresses. To withstand such loads, the codes typically call for a tensile modulus of rupture strength of at least 50 lbf/in2 (0.345 newton/mm2) for the finished block. In addition to being an inexpensive material with a small resource cost, adobe can serve as a significant heat reservoir due to the thermal properties inherent in the massive walls typical in adobe construction. In climates typified by hot days and cool nights, the high thermal mass of adobe mediates the high and low temperatures of the day, moderating the temperature of the living space. The massive walls require a large and relatively long input of heat from the sun (radiation) and from the surrounding air (convection) before they warm through to the interior. After the sun sets and the temperature drops, the warm wall will continue to transfer heat to the interior for several hours due to the time-lag effect. Thus, a well-planned adobe wall of the appropriate thickness is very effective at controlling inside temperature through the wide daily fluctuations typical of desert climates, a factor which has contributed to its longevity as a building material. Thermodynamic material properties are sparsely quoted. The thermal resistance of adobe is quoted as having an R-value of R0 = 0.41 h ft2 °F/(Btu in) and a conductivity of 0.57 W/(m K) quoted from another source. A third source provides the following properties: conductivity=0.30 Btu/(h ft °F); heat capacity=0.24 Btu/(lb °F); density=106 lb/ft3 (1700 kg/m3). To determine the total R-value of a wall for example, multiply R0 by the thickness of the wall. From knowledge of the adobe density, heat capacity and a diffusivity value, the conductivity is found to be k = 0.20 Btu/(h ft °F) or 0.35 W/(m K). The heat capacity is commonly quoted as cp = 0.20 Btu/(lb F) or 840 joules/(kg K). The density is 95 lb/ft3 or 1520 kg/m3. The thermal diffusivity is calculated to be 0.0105 ft2/h or 2.72x10−7 m2/s. 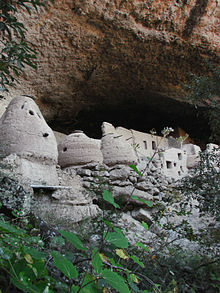 Cliff dwellings of poured or puddled adobe (cob) at Cuarenta Casas in Mexico. Poured and puddled adobe (puddled clay, piled earth), today called cob, is made by placing soft adobe in layers, rather than by making individual dried bricks or using a form. "Puddle" is a general term for a clay or clay and sand-based material worked into a dense, plastic state. These are the oldest methods of building with adobe in the Americas until holes in the ground were used as forms, and later wooden forms used to make individual bricks were introduced by the Spanish. Bricks made from adobe are usually made by pressing the mud mixture into an open timber frame. In North America, the brick is typically about 25 by 36 cm (10 by 14 in) in size. The mixture is molded into the frame, which is removed after initial setting. After drying for a few hours, the bricks are turned on edge to finish drying. Slow drying in shade reduces cracking. 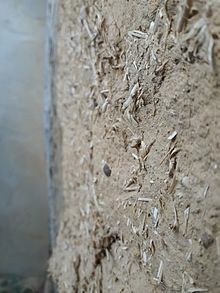 The same mixture, without straw, is used to make mortar and often plaster on interior and exterior walls. Some cultures used lime-based cement for the plaster to protect against rain damage. Depending on the form into which the mixture is pressed, adobe can encompass nearly any shape or size, provided drying is even and the mixture includes reinforcement for larger bricks. Reinforcement can include manure, straw, cement, rebar or wooden posts. Experience has shown straw, cement, or manure added to a standard adobe mixture can all produce a stronger, more crack-resistant brick. A test is done on the soil content first. To do so, a sample of the soil is mixed into a clear container with some water, creating an almost completely saturated liquid. The container is shaken vigorously for one minute. It is then allowed to settle for a day until the soil has settled into layers. Heavier particles settle out first, sand above, silt above that and very fine clay and organic matter will stay in suspension for days. After the water has cleared, percentages of the various particles can be determined. Fifty to 60 percent sand and 35 to 40 percent clay will yield strong bricks. The Cooperative State Research, Education, and Extension Service at New Mexico State University recommends a mix of not more than 1/3 clay, not less than 1/2 sand, and never more than 1/3 silt. The ground supporting an adobe structure should be compressed, as the weight of adobe wall is significant and foundation settling may cause cracking of the wall. Footing depth is to below the ground frost level. The footing and stem wall are commonly 24 and 14 inches thick, respectively. Modern construction codes call for the use of reinforcing steel in the footing and stem wall. Adobe bricks are laid by course. Adobe walls usually never rise above two stories as they are load bearing and adobe has low structural strength. When creating window and door openings, a lintel is placed on top of the opening to support the bricks above. Atop the last courses of brick, bond beams made of heavy wood beams or modern reinforced concrete are laid to provide a horizontal bearing plate for the roof beams and to redistribute lateral earthquake loads to shear walls more able to carry the forces. To protect the interior and exterior adobe walls, finishes such as mud plaster, whitewash or stucco can be applied. These protect the adobe wall from water damage, but need to be reapplied periodically. Alternatively, the walls can be finished with other nontraditional plasters that provide longer protection. Bricks made with stabilized adobe generally do not need protection of plasters. The traditional adobe roof has been constructed using a mixture of soil/clay, water, sand and organic materials. The mixture was then formed and pressed into wood forms, producing rows of dried earth bricks that would then be laid across a support structure of wood and plastered into place with more adobe. Depending on the materials available, a roof may be assembled using wood or metal beams to create a framework to begin layering adobe bricks. 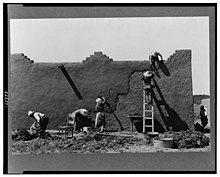 Depending on the thickness of the adobe bricks, the framework has been preformed using a steel framing and a layering of a metal fencing or wiring over the framework to allow an even load as masses of adobe are spread across the metal fencing like cob and allowed to air dry accordingly. This method was demonstrated with an adobe blend heavily impregnated with cement to allow even drying and prevent cracking. The more traditional flat adobe roofs are functional only in dry climates that are not exposed to snow loads. The heaviest wooden beams, called vigas, lie atop the wall. Across the vigas lie smaller members called latillas and upon those brush is then laid. Finally, the adobe layer is applied. To construct a flat adobe roof, beams of wood were laid to span the building, the ends of which were attached to the tops of the walls. Once the vigas, latillas and brush are laid, adobe bricks are placed. An adobe roof is often laid with bricks slightly larger in width to ensure a greater expanse is covered when placing the bricks onto the roof. Following each individual brick should be a layer of adobe mortar, recommended to be at least 25 mm (1 in) thick to make certain there is ample strength between the brick's edges and also to provide a relative moisture barrier during rain. Roof design evolved around 1850 in the American Southwest. Three inches of adobe mud was applied on top of the latillas, then 18 inches of dry adobe dirt applied to the roof. The dirt was contoured into a low slope to a downspout aka a 'canal'. When moisture was applied to the roof the clay particles expanded to create a waterproof membrane. Once a year it was necessary to pull the weeds from the roof and reslope the dirt as needed. Depending on the materials, adobe roofs can be inherently fire-proof. The construction of a chimney can greatly influence the construction of the roof supports, creating an extra need for care in choosing the materials. The builders can make an adobe chimney by stacking simple adobe bricks in a similar fashion as the surrounding walls. The largest structure ever made from adobe is the Arg-é Bam built by the Achaemenid Empire. Other large adobe structures are the Huaca del Sol in Peru, with 100 million signed bricks and the ciudellas of Chan Chan and Tambo Colorado, both in Peru. ^ definition of adobe from Oxford Dictionaries Online. Retrieved 25 December 2010. ^ "the definition of adobe". www.dictionary.com. Retrieved 30 September 2018. ^ de Chazelles-Gazzal, Claire-Anne (1997). Les maisons en terre de la Gaule méridionale. Montagnac, France: Éditions Monique Mergoil. pp. 49–57. ^ Rose, William I.; Julian J. Bommer (2004). Natural hazards in El Salvador. Geological Society of America. p. 299. ISBN 978-0-8137-2375-4. ^ Vargas, J.; J. Bariola; M. Blondet (1986). "Seismic Strength of Adobe Masonry". Materials and Structures. 9 (4): 253–256. doi:10.1007/BF02472107. ^ Garrison, James. "Adobe-The Material, Its Deterioration, Its Coatings" (PDF). pp. 5–16. Retrieved 27 February 2013. ^ Austin, George. "Adobe as a building material" (PDF). New Mexico Geology, November 1984. New Mexico Bureau of Mines and Mineral Resources. p. 70. Archived from the original (PDF) on 2 December 2013. Retrieved 27 February 2013. ^ "14.7.4 NMAC" (PDF). Archived from the original (PDF) on 18 August 2013. Retrieved 25 June 2013. ^ "2009 New Mexico Energy Conservation Code: Residential Applications Manual" (PDF). Emnrd.state.nm.us. Retrieved 21 July 2013. ^ Chávez-Galán, Jesus; Almanza, Rafael; Rodríguez, Neftali (2008). "Experimental Measurments of Thermal Properties for Mexican Building Materials to Simulate Thermal Behavior to Save Energy". Experimental Measurements of Thermal Properties for Mexican Building Materials to Simulate Thermal Behavior to Save Energy. Spriner. pp. 496–501. doi:10.1007/978-3-540-75997-3_89. ISBN 978-3-540-75996-6. ^ "HVAC Systems AE-390". Drexel University. Retrieved 25 November 2014. ^ "Mass and insulation with adobe". Green Home Building. Retrieved 25 June 2013. ^ "puddle, n. 4.". Oxford English Dictionary 2nd. ed. 2009. CD-rom. ^ Keefe, Laurence (2005). Earth Building: Methods and Materials, Repair and Conservation. London: Taylor & Francis. p. 22. ISBN 978-0415323222. ^ Technical Information Online. "Mud Plasters and Renders – Technical Information Online – Practical Answers" (PDF). Practicalaction.org. Retrieved 9 November 2010. ^ "Preservation of Historic Adobe Buildings". Dawson Lupul. Retrieved 30 January 2014. ^ "How Adobe Construction Works". Add Water, Then Stir – How Adobe Construction Works | HowStuffWorks. 17 April 2012. Retrieved 24 October 2017. Wikimedia Commons has media related to Adobe. Look up adobe in Wiktionary, the free dictionary. Cal-Earth (The California Institute of Earth Art and Architecture) has developed a patented system called Superadobe, in which bags filled with stabilized earth are layered with strands of barbed wire to form a structure strong enough to withstand earthquakes, fire and flood. Earth Architecture – A website whose focus is contemporary issues in earth architecture. Earth Architecture and Conservation in East Anglia – British organisation that focuses on the proper maintenance and conservation of earth buildings in a region of the UK that has a long history of building with mud. Kerpic.org – A website on earthen architecture researches stabilized with gypsum. Kleiwerks – International organization recognized for their unique contribution to modern earthen and natural building techniques throughout the world, their focus is on education through hands on experience. Very experienced experts are contactable and there are regular demonstrations in the area. 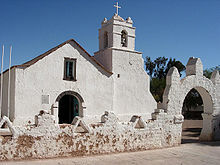 World Monuments Fund – Adobe Missions of New Mexico – Description of a project of the World Monuments Fund for the preservation of adobe churches in New Mexico, in the United States.